This bizzare cartoonish creature is Taonius borealis, one of the two recognized species in the Taonius genus. 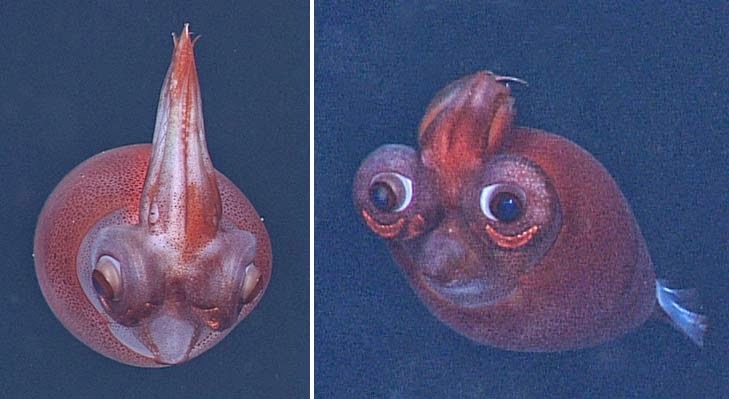 T. borealis is an oceanic glass squid that inhabits great deep-waters. It is known to occur in boreal and sub-Arctic regions of the North Pacific Ocean. 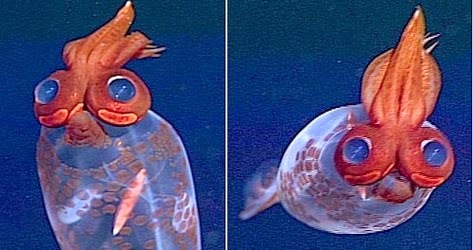 They have been observed to lurk in depths greater than 2,000 m.
Adults grows to be about 50 cm and have large eyes that are pointed forward. However, they can direct them laterally as well as can be seen in the image down below.The maximum known length is 66 cm.